Evan King and Jason Jung win the toss and elect to serve. It’s the doubles final of the United States Tennis Association’s City of Sunrise Open, and after two unseasonably frigid days, the sun’s blaze has returned to South Florida. After King, a tall and lanky African American, thumps his lefty serve and elicits a return into the net, taking the first point, I turn my head to count the fans in attendance. It’s Friday, January 17, and the tennis world’s attention is focused half a world away, on Australia, where in a few hours Donald Young, the last American man in the draw, will get steamrolled in the third round. For his efforts, Young, ranked no. 91 in the world, will earn $75,000 before taxes.1 Here in Florida, King and Jung, ranked 590th and 379th,2 respectively, each stand to win $310 if they prevail. Of all major professional sports, tennis is the cruelest to its non-stars. King and Jung both graduated from the University of Michigan. Fellow Wolverine Trey Burke, rookie point guard for the Utah Jazz, will make $2.439 million this year, but even his teammates who don’t make the National Basketball Association can earn six-figure salaries abroad. Thanks largely to players’ unions, pine-riding baseball and football players also earn a comfortable living. And golf’s lesser players stand to make far more than their tennis counterparts. American golfer Chad Collins, ranked 330th in the world, earned more than $190,000 for two weeks’ work in January. Meanwhile, after graduating last May, King earned just over $9,000 in 2013, while Jung, who graduated two years earlier, has made $22,198 so far. The Sunrise event is a Futures tournament, part of a series of events that comprise the lowest rung of professional tennis. For the world’s best, Futures are a pit stop. Rafael Nadal won his first Futures tournament in Alicante, Spain, a month after turning 16. Andy Murray was only a few months older when he won his first Futures title in Glasgow. They quickly graduated to the Challenger tour, tennis’s second tier, and then to the Association of Tennis Professionals World Tour and Grand Slams. The total purse at this year’s Australian Open is $33 million; at Sunrise, a men’s-only event, it’s a mere $10,000, split among 32 singles players and 16 doubles teams. Across the net from the Michigan alumni are two players who likely will never set foot in a college classroom. Fifteen-year-old Francis Tiafoe, from Maryland, recently won the 18-and-under division of the Orange Bowl, the world’s most prestigious juniors tournament after the junior Grand Slams. He’s the youngest champion in the history of an event whose past winners include Roger Federer, Jim Courier, John McEnroe, Ivan Lendl, and Bjorn Borg. Tiafoe’s partner, William Blumberg of Connecticut, is six days younger and the fifth-ranked sophomore in the country. I arrived in Sunrise the previous Sunday, booking a room at the tournament-recommended La Quinta Inn for $105 a night. That was more than most players were prepared to spend. King was splitting a room with two other players. He had already been in Florida for a couple weeks, playing the first Futures event of the year in Plantation, only a few miles away. In the first round, he had fallen 6-1, 6-1 to the no. 2 seed, American Bjorn Fratangelo. King’s play earned him $104. Paired with fellow American Sekou Bangoura, who played two years at the University of Florida before turning pro, King lost in the doubles semifinals to two Florida State graduates, good for another $180.3 Jung skipped Plantation to train back home in California, but had arrived a few days before the Sunrise event to practice with King. I met them at the courts on Monday. It was the penultimate day of the qualifying tournament, and King and Jung were ranked high enough to gain direct entry into the main draw. Just two years separated them, but they were at markedly different stages of their tennis careers. Thanks to the vagaries of the tennis ranking system, where points are determined by the past year’s successes and failures, the next few months for King could only prove beneficial. At this time last year, he was entering his final semester at Michigan, so he didn’t have any points to defend.4 He had some money saved, a small sponsorship deal with upstart apparel company Athletic DNA, and supportive parents in Chicago, where his father, a former advertising executive, now teaches tennis and his mother works for the public school system. King has a girlfriend back on campus, a senior on the women’s tennis team, “but I’ve kind of accepted that my social life ended in Michigan,” he tells me. His goal for this year is to make the qualifying tournament at the U.S. Open. “That means I’ll have to get my ranking up a few hundred points or so,” he says. Within three years, he told The Michigan Daily, he hopes to be in the top 75. So he decided to commit himself to the pro tour, where his meager winnings have been supplemented by contributions from his family, several encouraging Michigan alumni, and older members of his hometown tennis club. Jung is ranked more than 200 spots ahead of King, and King freely admits Jung has become the better pro. (The record bears this out: Jung has won both of their professional meetings.) But while King remains highly optimistic about his career prospects, Jung sees 2014 as the year he either makes it to the next level or retires his racquets. “For the better part of the last two years, I’ve been a Futures player,” Jung says. “You’re grinding away for a few points, and you pretty much need to win the tournaments to cover your expenses. This coming year is going to be a big one for me, because I’m trying to get out of the Futures tour and play more Challengers and ATP events.” To do that, he’ll need to break into the top 200. “If I have to play another full year of Futures, I’ll probably stop,” he says. Jung is only 24 years old, probably still a few years from his athletic peak. But it doesn’t make much sense to stick around the Futures tour too long. “If you you’re still playing at 27, 28 and you haven’t graduated out, it’s a hard life and you’re never going to make any money,” says Brad Gilbert, a former top-five player who has coached Andre Agassi, Andy Roddick, and Andy Murray. In recent years, Gilbert says, the competition in tennis’s lower levels has improved dramatically, making it more difficult to advance. The American Futures tour consists of three types of players. The largest contingent, which includes King and Jung, is current or former college players. Off the court, they all display their loyalties: Ohio State sweatshirts, University of Southern California hats. (College gear is prohibited during match play.) University of Illinois coach Brad Dancer has brought a few of his top players to the Sunrise tournament to gain experience before the collegiate season. It’s true that not one of the top 10 players in the world attended college, but college remains a viable path to a good professional career. “It’s hard to go to college and become a no. 1 or no. 2 player in the world — that won’t happen,” Gilbert tells me. “But you can certainly become a top-20 player.” In fact, the United States’ top-ranked player, John Isner, played for the University of Georgia. And one of Dancer’s former Illinois players, South Africa’s Kevin Anderson, is seeded 19th at the Australian Open. Then there are the foreigners. At Sunrise, I meet a handful of Swedes traveling with a coach from their national federation. There’s 19-year-old Kyle Edmund of Great Britain, seeded fourth in the main draw, who is hoping to join his compatriots a few weeks later in San Diego to take on the United States in a Davis Cup tie. There are more South Americans than I can count. And there’s 18-year-old Yoshihito Nishioka from Japan, who is coached by Pat Harrison, father of Ryan Harrison, the 21-year-old American who has been ranked as high as 43rd in the world. Like his compatriot Kei Nishikori, ranked 17th in the world, Nishioka has trained at the IMG Bollettieri Academy thanks to the beneficence of former Sony CEO Masaaki Morita. “[Morita] sponsors fully three Japanese players each year until they turn 18,” Pat Harrison tells me. But now that Nishioka is 18, he’s paying Harrison out of his own pocket. But McCarthy is losing. He’s a quintessential American player — big serve, big forehand — and these weapons are slowed down by the surface, Har-Tru, commonly known as “green clay.” And McCarthy’s strengths are nullified even further by Tiafoe. Tiafoe already stands 6-foot-1, thin but muscular, and he moves around the court effortlessly, absorbing McCarthy’s pace and redirecting balls to the deep corners. On a few points, Tiafoe flattens out his forehand, and it’s a missile, revealing power and potential that belie his age. Quickly, McCarthy goes down a break. He’s pressing and missing. And it’s getting testy. A few weeks earlier, Tiafoe told the New York Times, “there’s nothing that bothers me more than cockiness.” But today he shows no deference to his opponent. After one argument over a line call — in the qualifying rounds of the tournament, players call their own lines but can ask roving officials to inspect marks — Tiafoe glares at his opponent and asks, rhetorically, “Why are you trying to be funny?” For some reason, tournament officials have placed only a single bench beside each court, which players share during changeovers. This only adds to the tension. After McCarthy surrenders the first set, 6-2, he curses himself. “Pathetic, absolutely pathetic,” he mutters. I turn to King: “Francis has too much game.” But King knows better. He’s been on the losing side to Ohio State too many times. “Devin’s a fighter,” he says. In the early stages of the second set, the match is Tiafoe’s for the taking. “I had break points, and then I made a couple of loose errors and it was me who was down a break,” he tells me afterward. The errors keep coming. Tiafoe’s coach, Mikhail Kouznetsov, says Tiafoe is winded from the last round of the quallies, a four-hour slog against an Ecuadorian clay-court specialist. “It’s still hard to get Francis to put in the gym time,” Kouznetsov says. McCarthy takes the second set 6-4. Quickly, Tiafoe goes down another break in the third and deciding set. With Tiafoe facing another break point at 0-2, McCarthy hits a shot that looks out to my eyes, but Tiafoe plays it, and his reply also looks to be a quarter-inch past the baseline. McCarthy doesn’t hesitate to extend his index finger toward the sky, the universal symbol for “out.” Tiafoe summons an official seated off-court, who appears to be as focused on her lunch as she is on the match unfolding before her eyes. She inspects the mark and upholds McCarthy’s call. Tiafoe protests, petulantly and to no avail. It’s now 3-0. And when Tiafoe loses the next game, he tosses his baseball hat over the fence in a fit of pique. But then, as so often happens in tennis, McCarthy tenses.5 Tiafoe isn’t playing any better, but McCarthy starts missing balls. After taking a commanding 5-1 lead, McCarthy loses two straight games, the last with a double fault, and a Tiafoe fan says loudly, “He’s tightening up.” But McCarthy’s cushion is sufficient, and he breaks back to take the final set 6-3. Thanks to rain showers, most of the first-round singles matches are pushed back to Wednesday. At nine in the morning, King takes the court against his first-round opponent, Kyle Edmund, the Brit. King’s big, lefty serve and his ability to come to net and put away points are neutralized by the surface. The rain has further slowed the claylike courts, and winners are hard to come by. King, like most Americans, prefers hard courts. But he starts crisply, while Edmund is struggling to find the range on his ground strokes. King breaks Edmund for a 3-1 lead. After 20 minutes, the sky clears and play resumes. Edmund and King hold serve to 6-all; a tiebreak will decide the first set. The players’ styles have been well established: King hits a loopier ball and tries to find Edmund’s backhand, while Edmund likes to dictate play with his inside-out forehand, a flat drive. They’re on serve in the tiebreak until 3-all, when King hits a backhand into the net. After a couple more loose errors, he finds himself facing two set points at 4-6. King unleashes a big first serve and follows it to net, only to see Edmund nail a cross-court backhand past him. In the second set, King tries to step into the court and attack more frequently, but the errors continue. Edmund finds his groove and controls most of the points with his forehand. Edmund wins 6-2, and King has lost in the first round for the second consecutive tournament. Meanwhile, Jung, seeded fifth, is struggling in his first-round match against Pedro Sakamoto from Brazil. Jung stands 5-foot-10 and is an aggressive baseliner in the Agassi mold, but he’s a little rusty and missing shots, while Sakamoto is a typical South American dirtballer, who stands well behind the baseline and is content to hit safe, heavy-topspin balls. After dropping the first set, Jung breaks Sakamoto early and begins to push him around the court, crowding the baseline and firing lasers from both sides. It’s a close match, but Jung prevails in three sets, not entirely satisfied with his performance. If he wants to rise to the Challenger tour, he’ll have to start steamrolling opponents like Sakamoto. I watch the final stages of the match with Pat Harrison, who’s scouting — Jung will face Harrison’s pupil, Nishioka, in the next round. “The thing about these Futures tournaments is that in a draw of 32, there are 27 guys who could win the tournament depending on who gets hot,” Harrison says. Even that might be understating the level of parity. Last week’s tournament in Plantation was won by a qualifier, Bangoura, the ex–University of Florida player. But here Bangoura falls in the first round to McEnroe’s protégé, Noah Rubin, who himself made it through the qualifying rounds. Earlier in the week, I take King and Jung out for dinner. They’ve been eating frugally, making trips to a local grocery store or, in King’s case, dining out at Denny’s and Popeyes. At Jung’s suggestion we decide to eat at Carrabba’s Italian Grill, a chain that’s perhaps a small step up from Olive Garden. Though South Beach is less than an hour’s drive, from what I can tell all the players are living as ascetics. King has lost in singles, so he allows himself a single beer. And since he’s out, I suggest that on Thursday, when Jung plays his second-round singles match, we hit. In 1996, David Foster Wallace wrote a profile of tennis player Michael Joyce for Esquire. At the time, Joyce was the 79th-best player in the world, though he’s better known now for being Maria Sharapova’s former coach. After watching Joyce play at a Montreal tournament, Wallace observed: “The idea of me playing Joyce — or even hitting around with him, which was one of the ideas I was entertaining on the flight to Montreal — is now revealed to me to be in a certain way obscene.”6 Like Wallace, I played Division III tennis, but unlike him I kept playing semi-competitively after college. I didn’t have any illusions about beating a player of King’s caliber, but the idea of sharing a court didn’t feel obscene. On Thursday afternoon, King was waiting for me. He had chosen, rather cruelly, one of the venue’s two show courts, beside the tented area where most spectators congregate. I would have preferred obscurity. We warmed up, played a 10-point baseline game (no serves), and then a tiebreaker (first to 10 points, with serves). “Oh, you’ll win a point, don’t worry about that,” Pat Harrison had assured me earlier in the day. And I did. Two points in each of the games. I would like to say these were aces or screaming forehand winners, but they weren’t. King simply missed a few balls. I wasn’t overwhelmed by the pace of King’s shots, but I quickly came to appreciate Harrison’s breakdown of professional players. If King can hit five or six world-class shots in a row, I (maybe?) can produce one. Once a point began, King was in complete control, pushing me around the court until I made an error or he had me sufficiently out of position — typically within a couple shots — to hit a winner. When Jung arrived, I ended our session so they could warm up in earnest. I confess to feeling slightly miffed when I saw King change his sneakers — apparently, he had been wearing his casual running shoes while we hit, not remotely worried that I’d make him scramble and risk turning an ankle. The fact that they’re still alive in doubles is small consolation for the Michigan duo. Only one player at the tournament, 27-year-old Florida State graduate Vahid Mirzadeh, is pursuing a doubles career. Last year, Mirzadeh reached his highest-ever doubles ranking of 169. “It may be easier to move up the ranks at first,” King says, “but there’s a lot less money in doubles. In singles, you can be about 150 in the world and make a decent living. In doubles you’d have to be at least in the top 50.” And even though King has had doubles success, he says he plays not for rankings points but for extra pocket money. On Thursday afternoon, in the semifinals, King and Jung eke out a close win against Mirzadeh and Jean-Yves Aubone. Aubone, who has a beautiful one-handed backhand, lost in the second round of singles to Edmund, even after winning the first set 6-0. Of all the players I met, Aubone was perhaps the most introspective about life on professional tennis’s bottom rung. He had a stellar collegiate career at Florida and also won two Futures tournaments while a student. But when he graduated in 2010 he was burned out and took a job at a small financial firm before joining Morgan Stanley in Miami. Then he felt the itch to play again, to make a committed run in the pros. 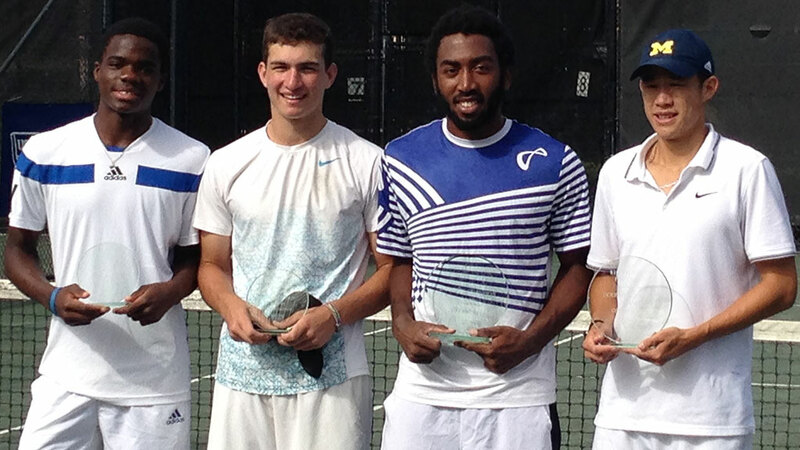 Left to right: Tiafoe, Blumberg, King, and Jung. Back in the doubles final, where Tiafoe and William Blumberg trail 3-0 in the first set, it’s a good thing for the teenagers that King and Jung aren’t the Bryan brothers. Blumberg’s service game reaches deuce, which means, in the quicker doubles format, the next point will decide the game and the receivers choose who will return serve. King returns, and there’s a long cross-court baseline rally before King hits a forehand long to give his opponents their first game. Both teams hold serve, and King and Jung remain up a break at 5-2. They reach deuce, set point, and Blumberg hits a forehand winner up the line. Still, it’s 5-3, and King can serve out the first set. Instead, Jung misses a couple volleys, Blumberg hits a winner down the middle, and it’s 0-40. The Michigan alumni fight back to deuce, but King misses a volley to give up the break. They have more chances, but when Jung returns a second serve into the net, all of a sudden the set is deadlocked, 6-all, and Tiafoe has found his game. In the tiebreak, he serves one ace and closes out the first set with two big serves. “How can you tell me that during the match?” Jung says afterward, chuckling. “Dude, it was only for one point, and then I was back on track,” King says. Another commanding lead wilts away. After fighting off two break points on Blumberg’s serve, the teenagers win their first game and trail 1-4. After the teams trade off breaking each other’s serve, King and Jung find themselves up 5-2. Tiafoe holds his serve, and King loses his. Finally, it’s 5-4, deuce, on Jung’s serve with Tiafoe receiving. “I told Will that I was going to hit a big return,” he tells me after the match. Instead, Jung fires an ace down the middle. “That was a huge point,” Tiafoe says later. In lieu of a third set, a tiebreak — first to 10, win by two — will decide the match. This time, the youngsters claim an early 3-1 lead after a Blumberg forehand splits King and Jung at the net. But with the match on the line, King and Jung regain their focus and execute their shots perfectly. They make their first serves and smother the net, putting the pressure on their opponents to go for more than they should. Instead of playing the percentages, hitting dipping shots at their opponents’ feet to solicit an error or weak volley, Tiafoe and Blumberg are trying for outright winners. They’re aiming for the court’s outer lines and missing. Down 6-9, triple-match point, Tiafoe serves and Jung replies with a bullet backhand that clears the net by an inch and lands for a clean winner. No one falls to his knees. King and Jung don’t bump chests. The handful of spectators applauds almost sheepishly as the players exchange pleasantries at the net. A tournament official brings a fold-up table onto the court and lays out the small, glass trophies for the winners and runners-up. Blumberg’s mother, a blonde who had taken off her boots and rolled up her jeans for the sun, walks barefoot onto the court to snap pictures. I say good-bye to the players, and then head to the airport. Edmund, who beat King in the first round, won the singles trophy. In a few days, it would all start again in Weston, Florida. Another Har-Tru tournament and another bad draw for King. He faced the top seed, Romania’s Victor Crivoi, a 31-year-old who’s trying to make a comeback after being ranked 75th in the world in 2009. King took the first set 6-0 but lost the next two, while his opponent, just like the previous week, went on to win the tournament. Jung fell in the second round again, this time to a former University of Kentucky player. In doubles, the Michigan graduates had another successful week, losing in the finals in a hard-fought tiebreaker. He was calling from Gainesville, where he was training with the University of Florida team and staying with a friend he met in the juniors. He’s glad to be back on the hard courts and will fly to Dallas in February to enter the qualifiers of a Challenger tournament. Jung will be there, too. For now, he’s home in California. At Sunrise, he did better than King in the singles, but he feels more disappointed in his play. “I didn’t play my best tennis, that’s for sure,” he says. It wasn’t so much the results, but that he found his thoughts straying on the court. “I was getting frustrated in my matches more than usual,” he says. “I try not to think about these things, but I was thinking about money, thinking about the grind,” he says. After Dallas, Jason says he’ll seek out far-flung Challengers where his ranking can get him into the main draw. With a few good results, he may be on a path to a financially sustainable career in tennis. Otherwise, over our dinner, Jung made a passing reference to law school. I’m happy to have chosen this path of tennis for the past two years because it has helped me grow and mature (well not completely, but slowly). Each tennis match brings uncertainty. But you prepare and put your effort in before and during the match to give yourself the best chance. Sometimes you come out on top and sometimes not. Tennis has taught me to enjoy everything that is thrown at us. Whether good or bad. The statement, at first glance, betrays little emotion. But beneath the surface, I think, is real feeling — an undercurrent of cautious optimism and also a small measure of sadness. Paul Wachter has written for The New York Times Magazine, New York Magazine, Bloomberg Businessweek, Harper’s, The Nation, The Atlantic, Grantland, and other publications. Illustration by John Tomac. I profiled Young in 2007 for The New York Times Magazine. The ages and rankings of the players featured in this article are current from the beginning of the Sunrise Open. All the prize amounts listed in this article do not account for taxes, which typically are deducted immediately. Tennis players move up the ranks by winning points. Winning the Australian Open is worth 2,000 ATP points. A first-round loser receives 10 points. The winner at the Sunrise event earns 18 points, while a first-round loser receives none. Coming into Sunrise, King has a total of 15 points and Jung has 107. After the Australian Open, Rafael Nadal had 14,330. Since Nadal didn’t play the Australian last year, he wasn’t “defending” points at the event. But Novak Djokovic, last year’s winner, was. He got to the quarterfinals, earning 360 points, but his 2,000 points from 2013 expired for a net loss of 1,640 points. Neither Jung nor King is defending points at Sunrise, but with the small point payouts at stake, players need to go deep in Futures events to advance to the Challenger circuit. “Only wrestling and boxing are as mentally taxing,” Pat Harrison says. Wallace’s 2006 profile of Roger Federer for the New York Times’s now-defunct Play magazine is widely celebrated. But for my money, the Joyce profile is better and more evocative of Wallace’s brilliance, as is his autobiographical essay “Tennis, Trigonometry, Tornadoes: A Midwestern boyhood,” which appeared in Harper’s.